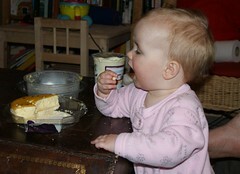 Anna and Amaia's blog: What does passion fruit cheesecake taste like? I found this cheesecake lying on the coffee table last night. I figured I was supposed to try it. Otherwise, why would they have left it there? I think it was particularly good with the custard I found in a pot at its side.